In 2011, we established "Wine & Spirits Culture Association", which is our long-sought goal for the purpose of contributing to the increase in the consumption of wine and spirits and also to the further development / promotion of the relevant industry. Further, we expect to widen the demographic for wine and spirits by establishing / managing the relevant various organizations. Through these activities, we would like to make a further contribution to the formation of sounder drinking environment. Development / education / training of human resources who work as an instructor. Establishment /management /mediation of various kinds of organizations. Publication and illuminating activities of wine and spirits. Planning /operation / management of various kinds of event, contest, seminar and others. Development /sales of various kinds of goods, software of lesson programs and books. President of Wine and Wine Culture Co.,Ltd. She studied mathematics at Tsuda College and after getting a bachelor's degree, she took the course of Wine & Spirits at Cornell University in New York, USA. She established “Yumi Tanabe’s Wine School” where many Sommelier have studied and the total number of graduated students are more than 10,000. Simultaneously she visited many viticultural areas in the world as one of representative wine specialists in Japan and devoted herself to write columns and articles related wines. She was conferred “L'order du merite Agricole” by French government for her contribution to extend wine culture in Japan. 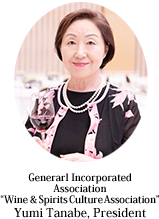 She established “SAKURA” Japan Women’s Wine Awards which has 3 aims; activation of wine market in Japan, offering compatible wines to Japanese dishes and making opportunity for women to work in wine industry. In addition, she has extended the activity beyond wine territory and involved in Cheese and Food field. She was appointed Honorary Principal of School for Wine Producers in Hokkaido. All about South African Wine (2013) etc.